The Lexus RC F is engineered for heart-hammering performance. Under the hood, an assertive and sophisticated naturally aspirated 5.0 litre V8 delivers up to 467 horsepower and 389 lb-ft of torque. For the first time in a Lexus performance engine, the RC F uses the Atkinson cycle at cruising speeds, while switching seamlessly to the Otto cycle for higher RPMs. This maximizes fuel efficiency while delivering an impressive 7,100-RPM range to satisfy even the most spirited driver. This remarkable engine is coupled to a uniquely-tuned eight-speed Sport Direct Shift automatic transmission, offering manual control through steering wheel-mounted paddle shifters. When operating in automatic mode, sensors detect when the RC F is powering through a curve and will hold the selected gear to deliver optimal response when accelerating out. The RC F features a highly-rigid chassis that’s the product of specialized manufacturing techniques. This keeps the coupe firmly planted on the road. The front and rear suspension systems are coil spring, independent, with monotube gas dampers and ball-jointed stabilizer bars, providing added strength and helping to reduce unsprung weight. The RC F is equipped with a four-setting Drive Mode Select system, including Eco Mode, Normal Mode Sport S Mode and Sport S+ Mode. Meantime, a sport-tuned Vehicle Dynamics Integrated Management system predicts and helps prevent skids using a combination of individual wheel braking, torque modulation and steering assistance. The VDIM system operates in several modes, including Expert mode for drivers who want total control over sliding and drifting. Massive Brembo brakes deliver the high-tech stopping power that’s essential in a high-performance luxury vehicle. Tailored specifically to the RC F, these feature six-piston front and four-piston rear monoblock calipers, plus rotors with a fast-cooling slotted design, aided by spiral fins to ensure excellent cooling. Curbside, the 2018 RC F is a knockout at every glance, sculpted for optimum aerodynamics and cooling. In profile view, a unique front hood rises. From the front, the striking signature Lexus spindle grille dominates from hood line to lower lip, featuring an RC F-exclusive mesh pattern. L-shaped air scoops flank the grille. At the rear, stacked trapezoidal quad-outlet tailpipes add to the impression of aggressive strength. Two variations of 10-spoke 19” forged aluminum wheels are available, both machine-polished to dazzle and fitted with the F series centre ornament. Other notable features include a hood scoop, automatic wipers, premium LED headlamps, LED daytime running lights, and LED tail lamps. Inside the RC F cockpit, low-set high back seats — with a striking embossed "F" on the headrests — are deeply bolstered and uniquely constructed to disperse body pressure and keep driver and front passenger firmly planted during high-spirited driving. Front seats are heated and ventilated. The 2018 Lexus RC F features a Lexus-first elliptical cross-section thick-grip steering wheel that feels as if it was moulded to the driver’s hands. The wheel is heated for all-weather comfort while its placement and shape plus the paddle shifters make it easier to change gears during performance driving, allowing for total driver engagement when tearing around the track. The RC F features an instrument cluster inspired by the Lexus LFA Supercar, which channels the spirit of aircraft instrumentation. The centrally mounted tachometer changes colour according to drive mode. At-a-glance information also includes digital and analogue speed readouts, torque vectoring monitor, G-Force meter, and even a stopwatch. Other in-cabin features of note include a 17-speaker Mark Levinson Premium Audio System with Bluetooth connectivity and integrated XM Satellite Radio, a 10.3” display, an organic LED multi-information display with Lexus customizable features, voice activated navigation system with Remote Touch interface, water repellent door glass, unique bottom-up LED ambient cabin lighting, the Smart Key System with Push Button Start, and more. New for 2018, all RC models feature Lexus Enform, delivering thoughtful connectivity and peace of mind technology in one simple to use package. Enform App Suite 2.0 puts favourite apps at one’s fingertips, and lets drivers bring their music along for the ride. Enform Destination Assist enhances navigation, while also providing embedded traffic and weather information. The RC F also features impressive safety performance. New for 2018, all models feature Enform Safety Connect including automatic collision notification, stolen vehicle locator, emergency assistance button and enhanced roadside assistance. Also new for 2018, all models feature Lexus Safety System +, including the pre-collision system with pedestrian detection, automatic high beam, dynamic radar cruise control, and lane departure alert with lane keep assist. Other safety features include intuitive parking assist, the Blind Spot Monitor and Rear Cross Traffic Alert safety systems, eight airbags, a backup camera, a direct tire pressure monitoring system, an onboard first aid kit, and more. 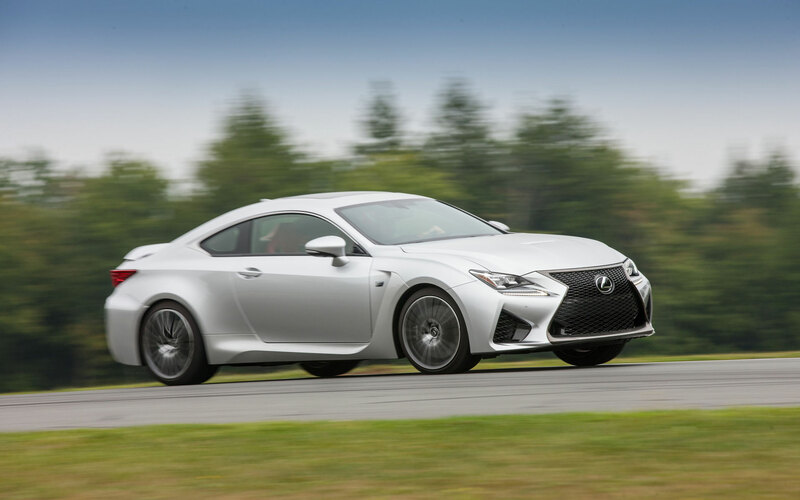 The 2018 Lexus RC F with Performance Package (starting MSRP: $94,450) adds a Torque Vectoring Differential, which has been meticulously tuned for precise control. Refined and proven on the world’s most challenging race circuits, the system optimally transfers torque between left and right tires and offers three modes: Standard, Slalom and Track. Standard provides a balance of agility and stability, Slalom emphasizes nimble steering response and Track boosts grip during acceleration. This model also inherits the carbon fibre Active Rear Wing directly from the Lexus LFA Supercar. This wing is stowed in the RC F’s trunk lid at speeds of 40 kph and below, helping to enhance fuel efficiency. At speeds of 80 kph or higher, the wing automatically deploys to smooth airflow from the roof and ensure excellent down force for greater handling stability. Other features in this package include unique 19” forged aluminum wheels, painted brake calipers, and a carbon fibre roof (with no moon roof). The 2018 Lexus RC F is now on sale at Lexus Dealers across Canada. For complete and up to date details and specifications, visit http://www.lexus.ca/rcf.